Fresh Landslide at Bhotebir near Sikkim border caused NH10 blockade early this morning. A large tree fell near Sevoke checkpost which was removed and the road was opened at that place by 9 am by joint ef fort of Public Works Department( PWD) and forest department. Regular landslide at Bhotebhir is causing massive problem for the vehicles going towards Sikkim and coming out of Sikkim. The vehicles are seen taking an alternate route of Rompu via Munsong Cinchona Plantation in Kalimpong. 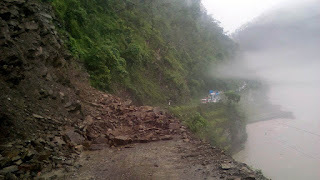 0 Respones to "LANDSLIDE NEAR SIKKIM BLOCKS NH-10"